The warm spring air blew in on the wind and stayed around long enough for the upper end of the big garden to dry out a bit. We tilled the upper portion and left the lowest quarter for later since it still was much too wet. We raked. We shaped the long beds back into their mounded shapes. Then, with dark clouds rolling toward us, we planted 700 row feet of peas. We planted the last row in the early sprinkles of what proved to be a slow gentle rain, the kind that soaks in to replenish the water table. 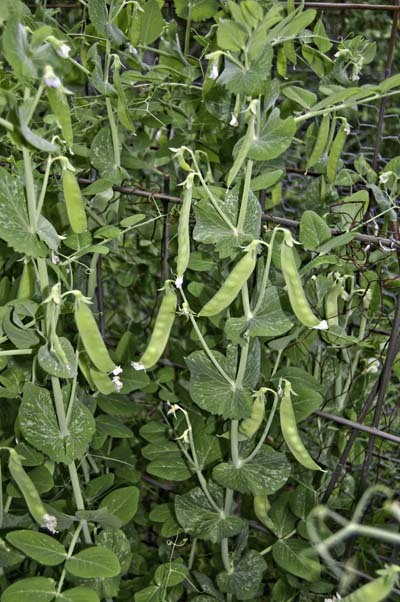 The Blizzard snow peas, whose vines typically stretch to about five feet, will have the fence panels for support. 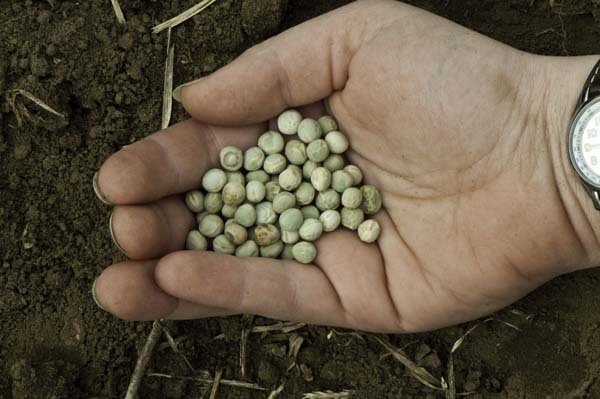 The shorter shell pea varieties we planted — Coral, Little Marvel, and Green Arrow — will have a more modest support system. Sturdy twine strung between narrow posts will be enough for their tendrils to latch onto, enough to keep their short and hopefully pea laden vines from sprawling across the pathways. Peas do better when they have plenty of space for air circulation around them. We plant by hand here, and we have a system that works for us. Till, level and shape the bed with a sturdy rake. Put up string to mark the rows — or not. Drag the hoe through the soil the length of each row to open up the trough where the seeds will go. Double rows, six inches apart. Two sets of double rows per raised mound. 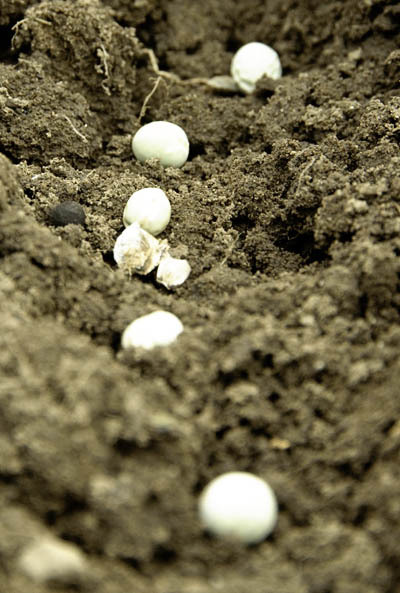 And then we plant – dropping the pea seeds into place. We each have our method of covering by hand, rake, hoe, or a bare foot dragged just so through the cool dirt. Planting distance and depth depends upon soil type and temperature. When I gardened in soil that was heavy with clay, I planted the seeds close — about an inch apart — in double rows set about six inches apart. The close planting seemed to help all the young sprouts push together to break the sometimes hard crust of the soil’s surface as they emerged. Here, where I’m growing peas in sandy loam, that’s much too close. I’ve had better results with a two-inch spacing within the row The sprouting seedlings have no clay crust to break through, and the plants seem to need a bit more room for their roots to spread and draw up nutrients. 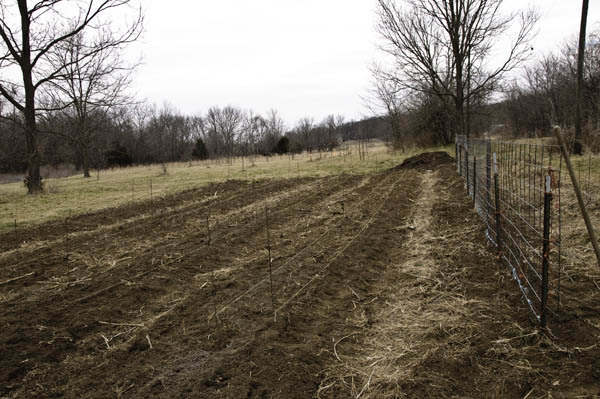 In early spring, I like planting in raised mounds where the soil warms more quickly and heavy rains drain away from the young plants without drowning them first. I plant more shallowly so the seeds benefit from the warmth in the soil’s top layers. 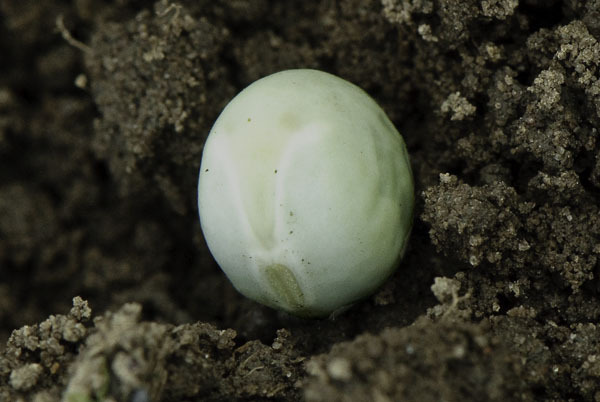 Later when the ground is warm and the topmost soil bakes in the sun, I plant more deeply so the emerging seeding can find moisture more easily and its tender roots have more shelter from the heat. And sometimes, when planting, I get distracted with details that don’t matter much but are fascinating anyway. I marvel at the colors and shapes, at the tiny ripples in the side of the seed. I notice the tiny grains of sand in the soil and the strands of organic matter around it — bits and pieces from last year’s plants that change with each passing day, disintigrating to become one with the soil itself. I marvel at the changes this seed will experience, how it will transform from this small round thing . . .
. . . to this lush growth in just a few weeks. These lovely Blizzard snow pea plants aren’t mine, and they’re not, of course, from this year. This is my first season growing Blizzard snow peas here at the farm. I sampled them last year at a neighbor’s seed-saving plot. Stuart, who operates a small nursery, specializes in hardy open-pollinated garden seeds and grows much of his stock himself. The supervisory crew . 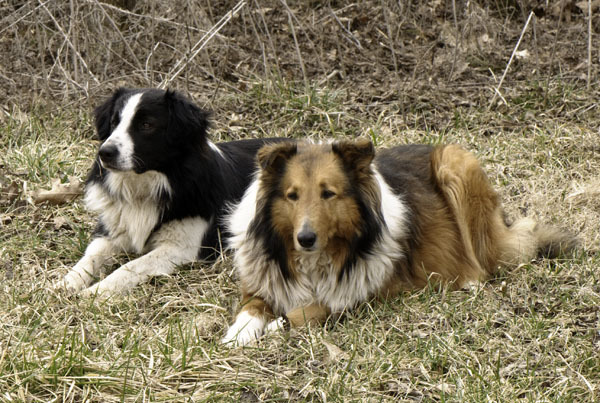 . . Freckles, on the left, is the youngest of our five farmcollies. He and Dinah, his dam, spent much of the winter ridding the garden area of rodents, and that included a certain amount of digging. He was, understandably, excited to see the humans digging and expected to do his part. And so he had to be reminded that once the humans reclaim any given section of dirt, it becomes a ‘keep off’ zone for dogs. After that reminder, Bossy Aunt Bebe settled down next to him in case he forgot and needed a good thumping. Bebe’s also known as The Enforcer around here. Note: I’ve adopted several new favorites in my strolls through Stuart’s organically managed gardens, where he nearly always has something new and interesting to show off. His website, A Few Good Plants, has a full listing of the varieties he has available now, and I know he’s testing several other promising varieties, some of which I may test here too. I’ll let you know how that works out as the season progresses. Wish we could be planting peas now. Have to wait at least a month. How long does it take to pick all those peas? Forever . . . or maybe it just seems like it sometimes. The varieties don’t all mature at the same time usually, but still the picking gets tedious. Very well said. Thanks for posting this.